The most crucial game of the last round was the first loss of Al Naser (13-1) in Dubai on Monday night. Hosts were defeated by fourth ranked Al Wasl (11-3) 102-96. It ended at the same time the eight-game winning streak of Al Naser. Al Wasl have an impressive six-game winning streak. 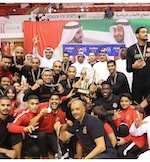 They moved-up to third place, which they share with Al Sharjah. Al Naser at the other side still keeps top position with one game lost. They share it with Ahli Shabab. Bottom-ranked Al Ain (0-14) is still winless. But it was rather predictable considering how strong their opponent was. 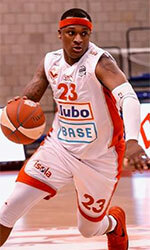 This time they lost on the road their 14th consecutive match to second ranked Ahli Shabab (13-1) 83-76. Ahli Shabab have an impressive eight-game winning streak. Defending champion used an opportunity after Al Naser lost their game and moved up joining them at the top position. Newly promoted Al Ain still closes the standings with 14 games lost. In the last game of round 14 Banijas lost to Al Sharjah on the opponent's court 91-96. Rather expected game when 6th ranked Banijas (6-8) were defeated on the road by third ranked Al Sharjah (11-3) 96-91. Al Sharjah maintains third position with 11-3 record having just two points less than leader Al Naser, which they share with Al Wasl. Banijas at the other side keep the sixth place with eight games lost. The most crucial game of the last round was the first loss of undefeated Al Naser (13-1) in Dubai on Monday night. Hosts were defeated by fourth ranked Al Wasl (11-3) 102-96. It ended at the same time the eight-game winning streak of Al Naser. Al Wasl have an impressive six-game winning streak. They moved-up to third place, which they share with Al Sharjah. Al Naser at the other side still keeps top position with one game lost. They share it with Ahli Shabab.